There are typically 3-4 side visits oﬀered each semester in a variety of industries and limited to approximately 20 students. Secure your spot for a site visit by registering through LionSHARE. Past semester visits include the American Museum of Natural History, NBCUniversal, the Council on Foreign Relations, the U.S. Environmental Protection Agency, Bloomingdales, Thornton Tomasetti, and many others. Have an idea for a company you’d like to visit? Suggest an employer! How can I sign up for an upcoming site visit? Register under Events in LionSHARE. What should I expect from a site visit? You can expect to learn more about the organization, recruitment process and potential internship, volunteer and full-time opportunities. You will also experience the company culture and network with HR personnel, staﬀ members, and/or alumni working at the organization. Unless indicated diﬀerently for an individual site visit, the suggested dress code is business professional attire. How can I make the most of a site visit? Prepare ahead of time: Spend some time learning about the organization through its website, read its career pages, and check for postings on LionSHARE. Also, search for any recent news about the organization and know about its products and services. Prepare a list of questions and bring a pen and paper to take notes. Act Professionally: Although a site visit is not an interview, your contribution on the day can lead to an ongoing relationship with the organization. 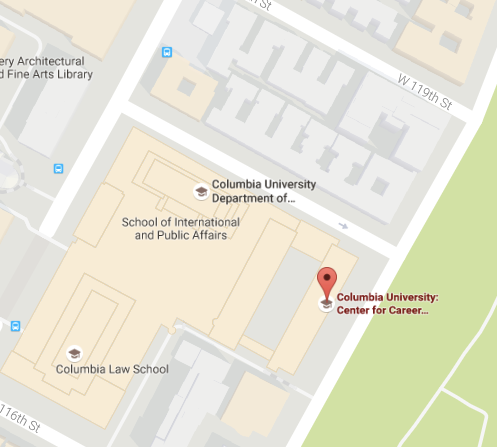 As a representative of Columbia University, you make a positive impression by showing an interest in the day’s activities and asking well-researched questions. This means you should not be using your cell phone or other devices during the site visit. What is the site visit cancellation policy? By registering for this event, you conﬁrm your commitment to attend. The event is limited to a small group of students. Your registration means that another interested student is not able to attend. If you can no longer attend the event, you must cancel your registration by 5 pm two business days before the event. Not attending the site visit or canceling less than two days before means that you will no longer be able to participate in the Site Visit Program for the remainder of the current semester.